I managed to spend a little time flirting with this while it was in the beta, but I was never able to devote a serious amount of time to playing. Now, at last, I’ve been able to join companies, form squads and march off to war. Or, I almost have, and I think I’ve experienced the same initial teething troubles as the rest of us. My first hours in the game gave me repeated crashes, disconnections and endless stuttering tanks, but things did improve. I’m also quite sure I’m still experiencing some recoil compensation, which I’m not too keen on, and I’m sure the performance of my game, or at least my frame rate, is also affecting how lethal my weapons are. But, you know what? I expected this and I don’t think any high profile online launch is ever going to be trouble free, history should’ve taught us that by now. 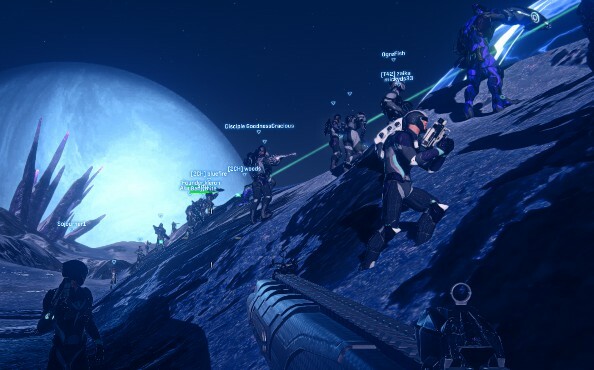 Most importantly, I’ve still had a good time playing Planetside 2 and I’ve already witnessed some great moments on the battlefield, including watching a column of some twenty tanks attack an enemy base and seeing the hills crawling with friendly troops as we surged forward to claim new territory. That’s not bad at all for a game that’s completely free and I think, once the bugs are ironed out and I gradually become a better soldier, this might be a war that I see quite a bit of. XCOM’s so much sweeter when killing troops elicits a cry of despair from the enemy general. And when that enemy general is Jeremy, well, that goes doubly so. 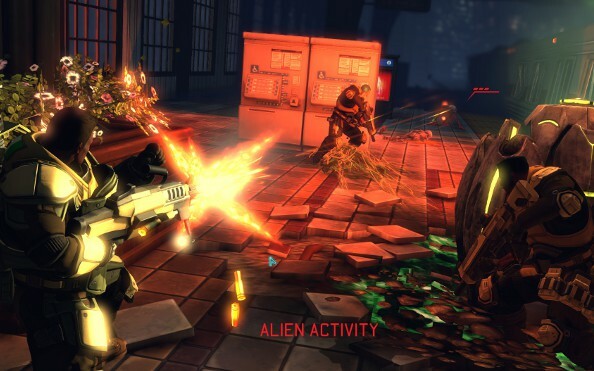 This week JP and I tried out XCOM’s multiplayer and it was a stressful bag: used to deliberating every decision in the singleplayer, the two minute turn timer consistently caught us with our PCGamesN-branded pants down – soldiers left outside of cover or scouts pushed forwards but turns running out before support teams can be moved into position. It was bloody… for Jeremy. Yup, I won both our games. The first round saw JP push through a pub in the centre of the map and out into the alley on the other side – an alley I had covered from both ends by a sniper and a heavy – that was half his squad in a single turn. The other half were killed when my rocket took out the police car they were sheltering (read: cowering) behind. The second round was more drawn out, each of us testing the other’s defences. Though by using scanner grenades and a rooftop sniper I was able to take down JP’s team one by one. (There was an awesome bit though when I managed to run an assault right through JP’s lines and take two of his squaddies from behind). All in all, I had a lot of fun. 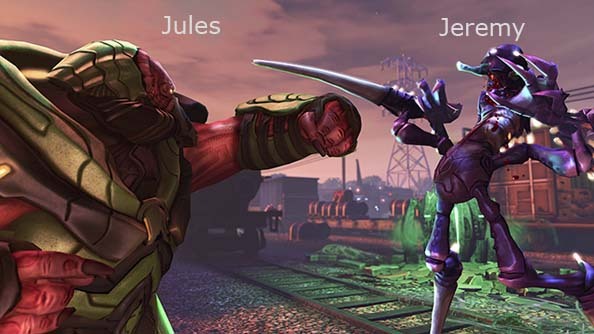 Ever since Jules casually punched new orifices into my squad the other day in multiplayer, my singleplayer XCOM life has become synonymous with disaster. I’ve been playing Classic Ironman for just over a month, and this morning became acquainted with the cutscene that marks the end of the world. In those last days – the kicking, screaming twilight of the independent human race – I’ve had a lot of time to ponder why exactly it is I keep going after every horrific squad wipe. How it is that a game in which defeat looms so tangibly and falls with such finality persuades me not the throw in the towel, but rather use it to tourniquet my wounds and carry on. The thing is this: no matter how few council members are sending me Christmas cards – and no matter how many names grace the memorial stone back at base – there’s always hope. So long as the dropship can spill four rookies onto the streets of Joburg, to flank, to potshot and to cower, there’s still the chance that Earth can be eased out of those cold, grey fingers with a little tactical thinking. I moaned, I raged, and I stared in genuine and abject horror at the events unfolding on my monitor, but until that final fade to black I never really let go of that towel. And now I’ll do it again. On Normal this time – pride be damned. 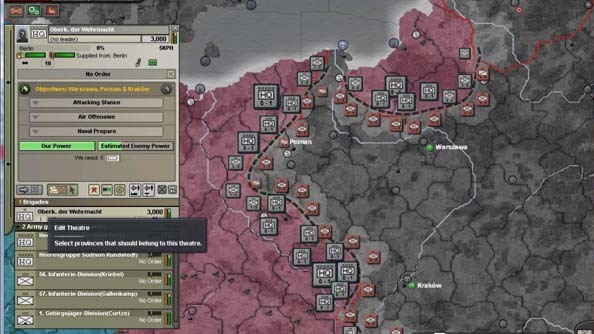 On August 14th, 2009 – A day that shall live in Infamy – Paradox Interactive released the third installment of their World War II Grand-Strategy game, Hearts of Iron. Three years on, and I’ve still never actually managed to see a game through to the end. It’s like the Forever War or something. The original release of the game had a lot of problems with it, but over time it’s been gradually getting better and better. With the latest expansion Their Finest Hour likely to be last for HoI3, I thought it’s high time I played a game through to the end and finally win the war. Usually, I let my imperialistic patriotism take over and play as the United Kingdom, but in the current playthrough I’m actually playing as the USA. They’re essentially the ‘easy’ choice as they don’t start as a member of any of the three factions, and it takes a lot of work to get them to join the Allies (or Axis or Comintern, which is possible) before the war starts in 1939. Plus, given that America is so big and industrialised, it’s quite easy to build up a large military within the time you have, as well as develop all the latest technology. Now that I’ve been finally dragged into the war however, I’m starting to face the real test. The Japanese naval forces seem to be better than mine, so there’s been some tough fighting out in the Pacific, and I’m just starting to see how well ‘Island Hopping’ works in this game with my Marines and the the US 2nd Army. Meanwhile, the rest of the Allied AI has been sucking some serious nuts, so essentially I had choice to make. Do I retake Norway? Do I try and launch D-Day early? Do I help the Brits against the Italians in the Mediterranean? So many choices. At the time of writing, I’m currently retaking the Middle East with a view to kick the Italians out of North Africa before invading them proper, whilst I try and kick the Japanese out of the Pacific. I might invade them, might not. Will see how I feel when I get there. The great thing about a holiday, an honest-to-goodness holiday when your family and loved ones can demand you do nothing but participate in home life and stay away from work, is that it frees you from any sort of guilt that you’re not working. The truth is, if you’re working during Thanksgiving and you only pause to eat the feast your girlfriend prepared in secret, you’re just being a jerk. So I’ve had almost 48 hours to relax, read, watch sports, and enjoy a couple cold autumn days with my girlfriend. I’ve also learned that one can get hungover from food. I feel like I’m lucky to have survived my first encounter with a turducken. When I haven’t been facing down a pile of poultry the size of a toddler, I’ve been playing Planetside 2. Like Paul, I have reservations and some decisions (like the way it handles recoil) are simply ridiculous. I worry the in-game currency is balanced a little too much toward the grind: I played for hours this weekend and I’m still a long, long way from anything but basic weapon loadouts. And yet: I fought alongside PC Gamer’s Evan Lahti for about four hours the other day, and together we helped lead the Vanu faction to a final victory on Esamir, pinning both the other teams in their bases. 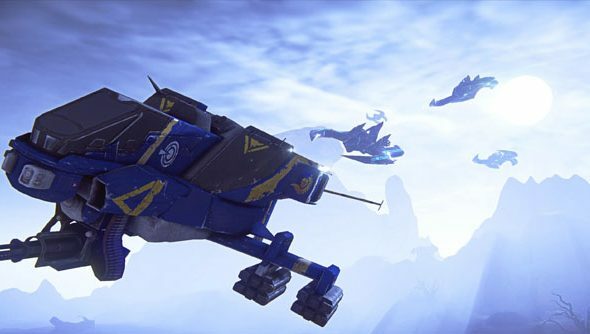 I will never forget the last drive against the Terran Republic, as we crested a hill in our tank and saw an ocean of Vanu tanks around us while waves of aircraft flew overhead. Or when we were laying siege to the Terrans later that night, and I stood in a trench filled with Vanu infantry and armor while laser fire flashed overhead and fighters dueled against the sky. For such moment, I’ll forgive an awful lot. Planetside 2 took my breath away several times just in the few hours I’ve spent with it, and those moments keep me coming back. This game is infuriating. At one moment I loathe the linear levels, another I’m awash in pure nostalgia. It’s almost like Hitman is going through an identity crisis of his own, one too many disguises making Hitman forget his origins. Compared to the previous games, this is about as linear as it gets, even the “open missions” are pretty closed off in terms of freedom. Some of the levels are laughable though, not making any sense whatsoever. Without spoilers, one of these levels involves Agent 47 walking into a gun shop and spotting his beloved silverballers. He then asks for them, to which the shopkeeper replies “bla bla no, bla bla do meaningless mini-game for me”. Ok I’m sorry but I’m THE freaking Hitman, and instead IO wants me to go play shootout with a cowgirl. Naturally I silently took care of the shopkeeper, giving the mini-game my middle finger. But still I wonder why on earth that was even in the game, providing nothing to the story whatsoever. 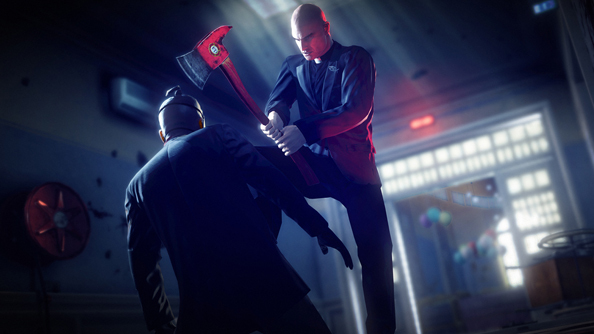 Granted, IO wanted to weave a very personal story with Hitman; but some levels are just plain horrid. More on this as I progress further, the story being this games last chance at redemption.